the possibility of relating to a Mary who is the apocalyptic Virgin of Fatima and yet also "always our sister"
Readers who know the geography of Los Angeles Catholicism will surely enjoy Wright's reflection on familiar places. But there is much here that will fascinate anyone interested in either the history of Christianity in America or devotion to Mary by those who love her today. Wendy M. Wright is professor of theology at Creighton University. She is the author of many books, including The Essential Spirituality Handbook; Heart Speaks to Heart: The Salesian Tradition; and Sacred Heart: Gateway to God. This book is a major contribution to the place of Mary in contemporary Catholic spirituality. Accompanying the author and her photographer as they criss-cross the busy freeways of this bafflingly diverse megalopolis, the reader is led through the web of Marian devotions and the history of the many communities that make up today's Los Angeles and brought to see how the figure of Mary combines faith with culture. Readers who love Mary, those who are fascinated by southern California, or those who seek to understand why the figure of the Virgin continues to compel will all find in this poignant and elegantly written text things to inform and delight. This volume recommends itself to several audiences, including curious general readers, scholars of Marian devotional art and practice, and all interested in the shape of contemporary Catholicism in the United States. It is advisable as a purchase for theology libraries and those that serve wider readerships alike. These pages take us into the very heart of Mary and the marvelous City of Angels. This book is a treasure for pilgrims or anyone who wants to become one. The intersection between academic theology and the theology of lived experience does not occur as often as it should. In this, her fifteenth book, Wendy M. Wright makes this intersection substantive and engaging, marrying autobiographical narrative with theological reflection. As a personal exercise in "lived religion," her reflections are more compelling than the detached cerebral forays of those merely observing the practices of others. Wright therefore demonstrates the contextuality of what it means to do theology by displaying in honest prose and vivid imagery the meaning of returning home and the intertwining of stories among pilgrims. 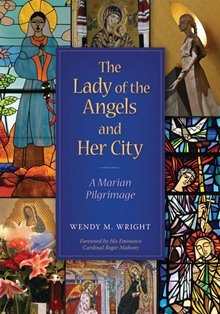 Wrights latest publication is highly recommended, not only for the beautiful Marian images contained therein, but also for the author's concise and poignant writing style. Although this work should appeal to a wide audience, it should be especially appreciated by students of cultural anthropology and Marian devotion in modern times. Wendy M. Wright writes like no one else in the field of spirituality today. Travel with her on this fascinating Marian pilgrimage, and you will discover worlds that extend far beyond Mary and Los Angeles-and ultimately, you will be brought home to yourself. Nobody brings together popular piety and serious theological reflection better than Wendy Wright. The heart and the intellect can go together. This book is proof! Here is a pearl of contemplative wisdom formed from layers of insight, discernment, friendship, expansive maternal sensibility, and the author's own 'soul moments.' It is a treasure of art, local history, and multicultural experience, perceptive theology, and awareness of how images of Mary could reinforce both women's oppression and freedom.